GoHawks Capture Four Individuals Titles! 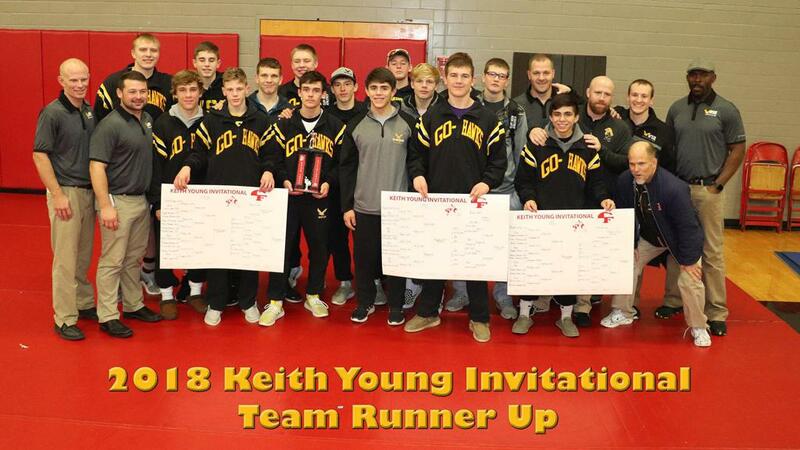 Championss Riggins, Roybal, Herrmann and Wolf lead WSR to a second place finish at today's Keith Young Invitational. In a tournament filled with six top 10 ranked teams and 66 ranked individuals the GoHawks finished with 194 points trailing only Don Bosco. In addition to the four champs six other GoHawks captured medals on the day. Junior Evan Yant was the 132 pound runner-up and Bryson Hervol placed fourth. Dylan Albrecht and Andrew Snyder finished the day in 5th place. Cayden Langreck and Luke Walker rounding out the medal winners with 6th place finishes. aiden riggins (5-0) placed 1st and scored 28.0 team points. bailey roybal (5-0) placed 1st and scored 24.5 team points. zack barnett (1-3) place is unknown and scored 2.0 team points. dylan albrecht (5-1) placed 5th and scored 15.0 team points. evan yant (4-1) placed 2nd and scored 21.5 team points. Brady Benning (1-2) place is unknown and scored 1.0 team points. cayden langreck (3-3) placed 6th and scored 10.0 team points. bryson hervol (3-2) placed 4th and scored 13.0 team points. jacob herrman (5-0) placed 1st and scored 26.0 team points. gavin Wedemeier (1-3) place is unknown and scored 2.0 team points. darin whiteside (1-3) place is unknown and scored 2.0 team points. brayden wolf (5-0) placed 1st and scored 28.0 team points. Lucas walker (3-3) placed 6th and scored 9.0 team points. andrew snyder (5-1) placed 5th and scored 13.0 team points.